Howdy folks! 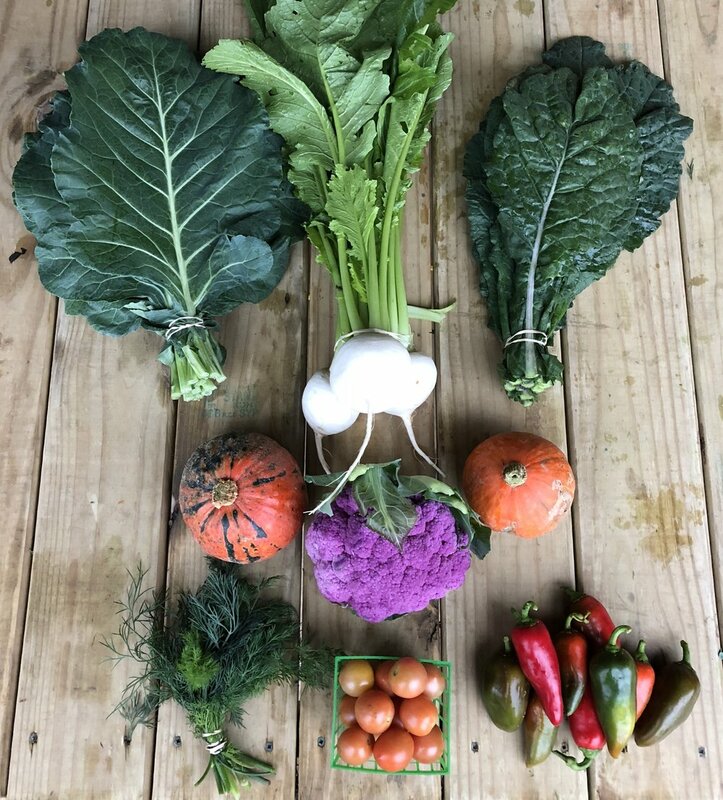 Welcome to your final CSA box for the year! We hope you have enjoyed all of your vegetables this season, and we look forward to another season in the upcoming spring and summer! We have already updated the website for the Spring/Summer sign up, so if you were hoping to gift someone a merry and healthy 2019, now you are able to do so! It will run 12 weeks starting the week of April 8th and go until the week of June 24th. We have shortened the season from last year’s 14 weeks to 12 weeks due to Mississippi’s ever changing heat patterns. Plus, 12 weeks is still an abundant bounty of vegetables for the season! 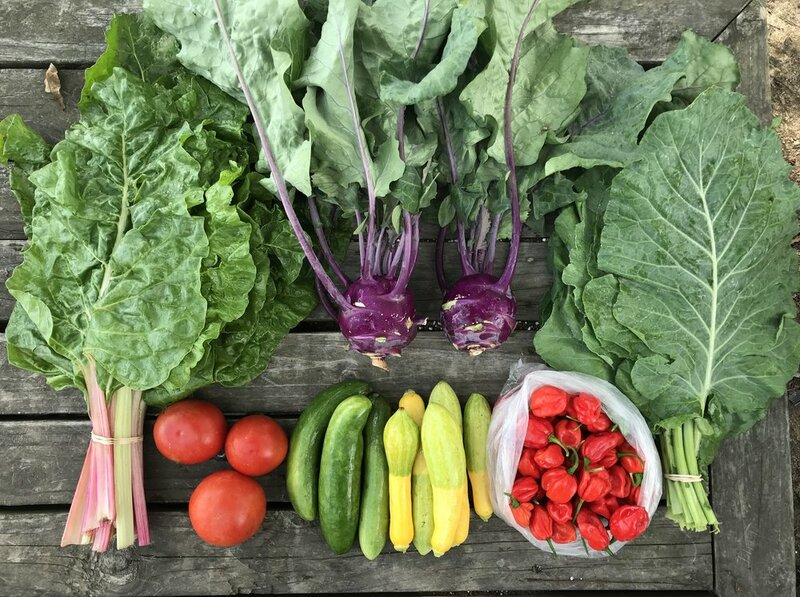 You will receive plenty of kale, greens, broccoli, cauliflower, carrots, squash, tomatoes, peppers, onions, potatoes, beets, green beans, and more! Click on the link HERE and it will take you to our sign up page! Please tell your friends and help us spread the veggie love. Thank you again for your support and helping us build and feed our community in the Jackson area. We wouldn’t be able to do what we love without you! Thank you! Until next year! Howdy Folks, and welcome to week 10 of your CSA! It’s hard to believe we have one more week after this one. We will be listing the Spring/Summer CSA sign up on the website in the next week or two! We will be looking forward to you signing up for next year so we can go ahead and order seeds, fertilizer, cover crops, etc., and get a jump start on next year’s season! We really appreciate all the support! Thank you! I am always very open and appreciative of any kind of feedback! Send me an email or call/text anytime you have anything you would like us to know about your box. We are always trying to learn and improve. We have high hopes to get another high tunnel or caterpillar tunnels for next year to help extend our season on more fragile and frost intolerant crops such as Swiss chard, lettuces, and baby greens. This year we received a freeze several weeks earlier than we have in the last few years, so a high tunnel or caterpillar tunnels would be very helpful. Fingers crossed it all works out. Carrots- Try the carrot gnocchi below! Fennel- Bulb fennel with green fronds. Try the caramelized fennel recipe below. Sorrel- The lemon of the vegetable world! Sorrel is a citrusy, tangy green. I often make soup, chop and add with salads, pesto, smoothies, and makes a great marinade for fish or chicken or any protein! Try the sorrel pesto soup recipe below. Cilantro- Try the Mexican gnocchi recipe below! Howdy folks! Welcome to week 9 of your CSA! We hope everyone had a great week and enjoyed your time spent with friends and family. Was anyone able to make a pie from the recipe shared last week? If so, I would love to hear some feedback! This time of year is my favorite because of all the pies to be had! New to your box this week are Dandelion greens! Some of you may be thinking, “that weed that grows in my yard that I try to get rid of every summer!??”. Well, yes it is, but this is a different variety than our native weed, and I am happy to say it is still loaded with TONS of medicinal and nutritional benefits. For many centuries, all over the world people have been using this green for its medicine, or just simply going in their back yard and harvesting the greens to make a lovely nutritional meal. All parts of the plant can be used as medicine, in fact the root and flowers are quite valuable in herbal medicine making. Here is a link highlighting the nutritional benefits of this green. Click Here for information on Dandelion Greens. Daikon Radish- Wonderful roasted as a side dish! Long Island Cheese Squash or North Georgia Candy Roaster- See recipe below for the best pie made with Long Island Cheese, North Georgia Candy Roaster, or Kabocha Squash. Great substitute for pumpkin/sweet potato pie. Collards- two servings so you can make a large pot of greens for your thanksgiving meal. Halve and de-seed squash. Place cut side down on oiled cookie sheet. Roast at 425 degrees for 35-45 minutes until fork tender. Scrape out cooked squash and mash with fork. Preheat the oven to 400. Drizzle squash halves with 1 TBS olive oil. Place cut side down on a prepared baking sheet. Roast in the oven for about 30-45 minutes (time will vary depending on the size of your squash) It should be fork tender. Meanwhile cook your quinoa. Place 1/2 cup quinoa with 1 cup of water. Bring to a boil. Reduce heat to low and cover for about 10-15 minutes or until water is absorbed and quinoa is light and fluffy. While quinoa cooks heat a large skillet over medium heat. Add shallots and saute’ for about 5 minutes. Add kale. Cook for about 5 more minutes stirring every so often. Remove from heat and set aside. When Squash is done roasting remove from oven. Scoop out flesh leaving 1/4 inch on sides and bottom. Mash the flesh with the quinoa and kale mixture. Add some blue cheese crumbles. Scoop quinoa mixture into squash halves. Crumble a little more blue cheese on top and place back in the oven for about 3 minutes or until cheese has melted. Season to taste with salt and pepper. Enjoy. Howdy Folks! Hope everyone is staying warm on this cold afternoon! I’m pretty excited about this week’s box, and the new additions. Sweet peppers, dill, kabocha winter squash, and drum roll.. cauliflower! I love our cauliflower, along with everything else of course ;). We are ready to see some sunshine, y’all! For the vegetables and herbs, but also for myself. I do however feel like eating seasonal vegetables does help with SAD or the winter blues. Not sure if it is something that is talked about much, but I do think it is a real disorder. Make sure to get lots of vitamin D in good sources of nuts, fatty foods and fish, and milk or yogurt. Also, a great way to stay healthy during flu season is to get a big dose of vitamin C with some seasonal and local greens. Some greens like collards and kale have more vitamin C than orange juice! The farm is sloppy and muddy. We have never seen it so muddy before! With the lack of sunshine to help dry up the fields and we have received 4 inches of rain! Yes, 4 inches! Van and I dream of one day having an enclosed packing facility! Concrete floors with drains, and walk in coolers that we can easily roll our products in and out of.. one day soon! **** Next week we will only have ONE PICK UP DAY at our farm location on Tuesday 11/20/18 from 4-6pm AND at M7 coffee house from 4-6pm. This of course is due to Thanksgiving. Our Delta delivery will remain the same for Wednesday 11/21/18 **** Please let us know if this does not work for you and we will try to figure out other arrangements. My phone number is 601-624-4914 or email twodogfarmsllc@gmail.com. We will be emailing everyone to make arrangements. Hakurei Turnips- A Japanese specialty salad turnip. Delicious stir fried, roasted, and grilled. Make sure to eat the greens with the turnips or set aside for another meal! Dill- Dill is also amazing chopped up finely and added to salads! Kabocha Squash- Pumpkin like squash. Great roasted and eaten alone, made into soup, or even made into a Kabocha “pumpkin” pie!! Excellent for Thanksgiving! 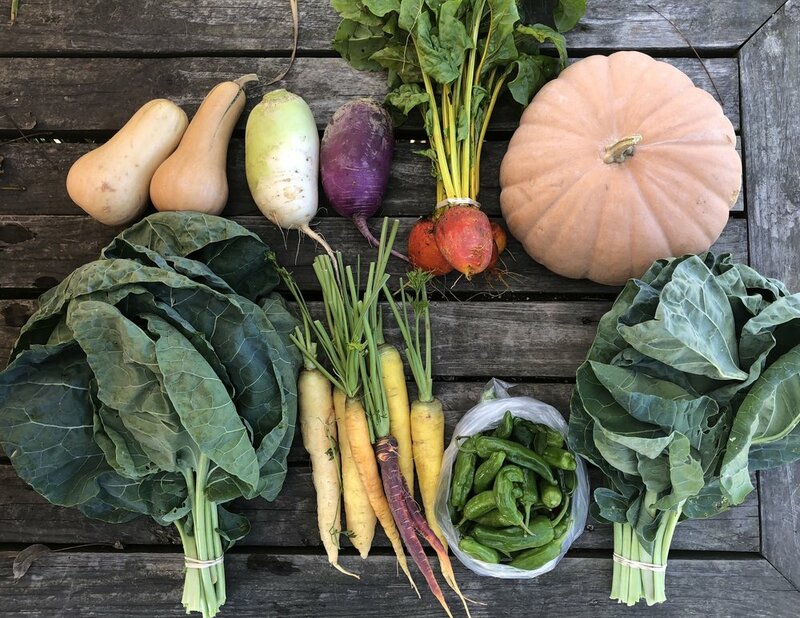 Hi Folks and welcome to week 4 of your fall CSA! We have another good one for you this week! We hope everyone enjoyed last week’s bounty. New to the box this week are, Sprigarello, head of lettuce, radishes, and Delicata Squash. So y’all have had the Sweet Dumpling, Butternut, and now the Delicata. I would love to hear some feedback on which one y’all like the best so far! Myself and the kids have been fighting a cold. It is that time of year again. I am making another round of elderberry syrup to try to keep it at bay the rest of the season. And I am making a big pot of greens and we are going to drink all the broth and eat all the greens. That is always an instant health boost. We just finished our last big planting of the year this past Saturday. It should get us through until the end of December. We went to the new True Local Market in Ridgeland this past Sunday. It is located at such a nice area, and Hazel was able to run around with other children and play on the playground. There was live music and a local vegan food vender. All in all it was fun! We hope y’all have a great week full of healthy meals. Here are the contents of this week’s box, Cheers! Delicata Squash- Another fine winter squash variety, this one you can leave the skin on, cook, and eat! Game changer!! Pickling Cucumbers- Stock up on pickles for the fall while you can! Spigarello- Cooking green that taste a lot like broccoli. Some refer to it as broccoli rabe and others call it "leaf broccoli." I'd put it somewhere between kale and broccoli. Top Row: Shishito Peppers, Red Russian Kale, Cherry Tomatoes, and Napa Cabbage! Bottom Row: Beefsteak Tomatoes, Arugula, Pickling Cucumbers, and Sweet Dumpling Winter Squash! Howdy folks and welcome to week 2 of your CSA! I hope everyone enjoyed their box last week. We have a great box this week! We are really looking forward to some cooler weather next week! I am sure that everyone can relate! In the box this week is one of our favorite peppers, shishitos. Some of our patrons know shishitos well and to some of you it is new. I will link an easy blistering recipe below that you don’t have to remove stems or anything! Just throw them into a hot skillet for a wonderful side dish or appetizer. I will also link an easy refrigerated pickles recipe to use as a guideline. Measurements would need to be edited! I will also add a kale salad with tahini dressing we made the other night that was a big hit. Red Russian Kale- A wonderful slightly curly and very tender kale. Cherry Tomatoes- Great for salads or try roasting with a favorite dish or fish. Napa Cabbage- Chinese cabbage, traditionally used in stir fries, but also great for raw salads or coleslaw. Arugula- One of my favorite greens that has a peppery flavor. Chop up for a salad all on its own, or as an addition to any salad. Also wonderful braised. Pickling Cucumbers- Can be used as pickling cucumbers or use as you would as a slicing cucumber. Sweet Dumpling Squash- Similar to acorn squash in size and appearance minus the stripes, but so much sweeter and has a great nutty flavor. Howdy Folks! 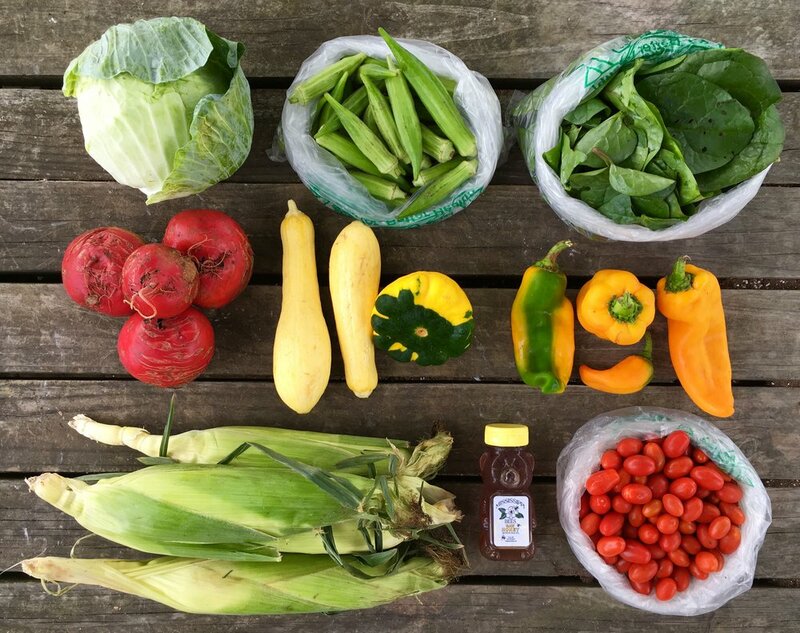 Welcome to your final CSA box this summer. We hope that you have enjoyed everything this past growing season. We had a good season with some ups and downs, but every year we are learning more and trying to become more successful! Thank you so much for taking the risk and joining us. I hope more than anything you were able to eat a little healthier and more often at home with family and friends. 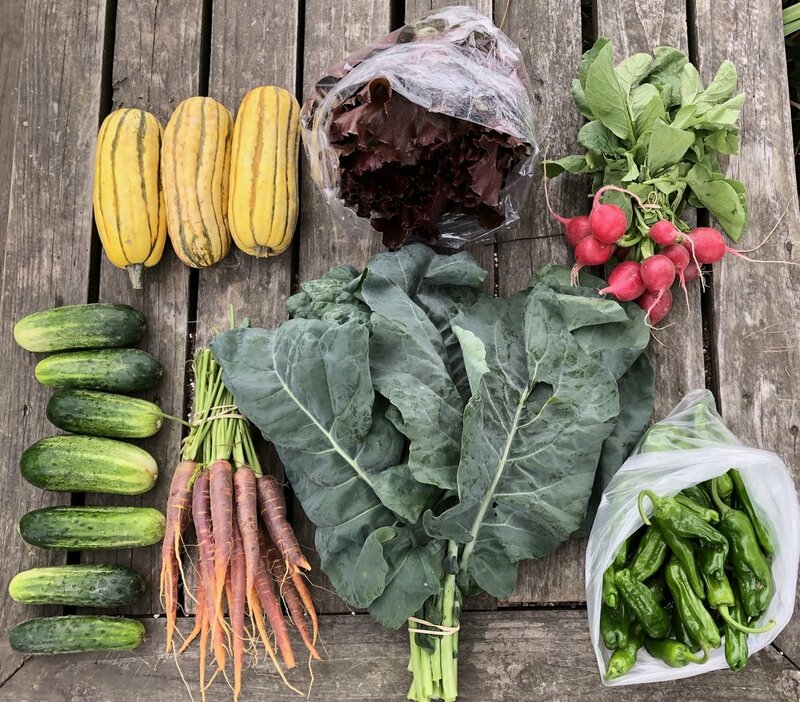 We have updated our website for the fall CSA, and a few of you already signed up. Thank you! We are looking forward to a really great fall season at the farm. It is my personal favorite time at the farm. Perhaps because it is not as hot, and the bugs aren't as intrusive, but I also LOVE all of the produce that time of year. We have been busy seeding and prepping our fields for the fall. We really hope you decide to join us again! We have had a lot of help from the NRCS this past year. They helped us get our high tunnel greenhouse. This was a huge addition for us to be able to start our own seed. We hope to apply for another one next year. They did a little write up HERE about our farm. 4. Chioggia Beets- The recipe for roasted beets with balsamic glaze below is good, but I actually like to roast them at a higher temp of 375-400 degrees and then roast for an additional 5-10 minutes after I add the glaze to them. Howdy folks! Welcome to week 13 of your CSA! We have a great box this week for you. New to your box this week are Witch's Stick peppers, Amaranth greens and Spinach! The peppers started off mild and with maturity they heat up. You can expect some heat, I needed water right after trying them, with the more mature pepper. Amaranth greens are the leaves of the amaranth plant, you may be more familiar with the grain. They are a beautiful deep green streaked with red and purple and can be eaten raw when young and tender, but are traditionally cooked. The most likely cooking suggestion you will get is to saute it with garlic, but you can use it anywhere you would include cooked spinach or Swiss chard. Amaranth greens are delicious with cumin, chile peppers or onions and hold up well to intensely spiced dishes like curry. Saute, mix into stew or add to sauces for extra nutrition and texture. Amaranth is full of iron! The spinach is a tender, red veined, amazingly heat tolerant, and vine growing variety called Malabar. We absolutely love this spinach! The farm has been good, and we were able to get some rows up in our bottom field to plant winter squash and fall tomatoes! If you have previously joined our CSA in the fall, you know the fall is a great time of the year in Mississippi to grow produce! 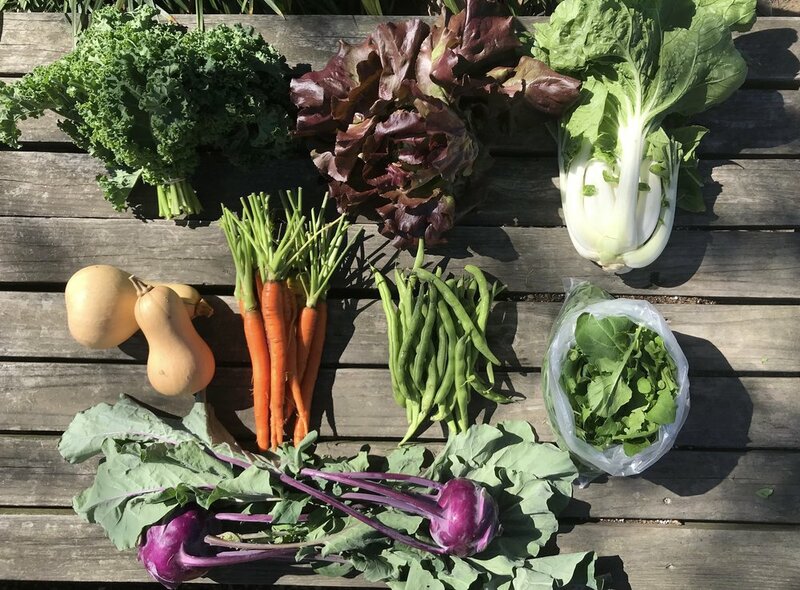 We are expecting to have everything from squash, zucchini, cucumbers, tomatoes to carrots, broccoli, cauliflower, salad turnips, lots of greens, and winter squash like butternuts, spaghetti, acorn, etc. Next week is our last week for the summer CSA, and we appreciate you all so much and hope that you will consider joining us in the fall! It will be a 10 week share starting around the 2nd week of October and ending the first or second week in December. We will get our website updated soon for signups. Unfortunately we were unable to get melons in the ground early enough this year due to rain, so we will not be able to include any in your CSA box for the 4th of July celebration. They are still a few weeks until they will be ready, darn! BUT we hope everyone has a great time celebrating and cooking some good food with loved ones. Happy Independence, y'all!! Hi folks, and welcome to week 11 of your CSA. We hope everyone has had a great week. I would like to say that we appreciate each and every one of our members. If there is ever an issue with your box of vegetables, please contact us personally so we can fix it. My phone number is 601-624-4914 (Dorothy). I am more than happy to talk to you and try to find a solution. Ready for some tomatoes?!! We literally have 1,000s of pounds right now! Tis the season for tomato pies, tomato sandwiches, tomato sauce, canning, tomato salads, caprese, and anything else that involves a tomato! I am seriously eating my weight in tomato sandwiches. SO GOOD. We received 1/2 an inch of rain in 20 minutes on Monday, and it has been raining every day since then with no intention of stopping. Do y'all remember the last couple of summers when we were in a drought? Crazy weather this summer in Mississippi. Of course we still have July and August left! Top Row: Beefsteak Tomatoes, Cured Onions, Watermelon Radishes, and Potatoes. Bottom Row: Green Beans, Cherry Tomatoes, Blueberries, and Shishitos. Hey everyone, hope y'all have had a great week. 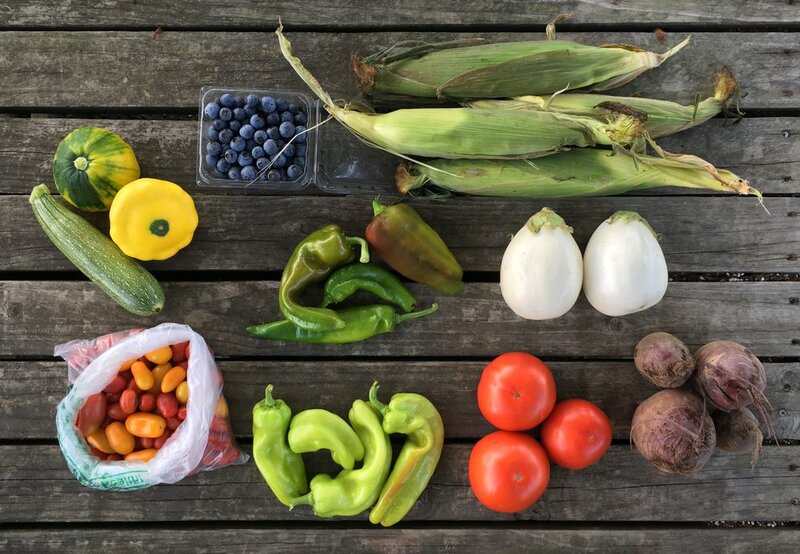 Welcome to week 10 of your CSA. We hope that you enjoyed the bounty last week. We were asked if the blueberries were organic, and if anyone else was wondering, they are. We get the blueberries from a family friend's farm in Brookhaven. They are so plump and sweet. I hope y'all have enjoyed them! We have gotten the rest of our summer field planted, and looking forward to some juicy melons! New additions to your box this week are beefsteak tomatoes, shishito peppers and pickling cucumbers. Are you ready for some tomato sandwiches? Van and I each ate 2 1/2 sandwiches the other night. They were really great, we almost went back for a 3rd sandwich! The pickling variety of cucumber is also really great to enjoy in salads, with dips, and sliced on top of dishes. Some of you may remember the shishito peppers from last year! They are a thin walled blistering pepper. Mild and sweet roulette pepper, meaning that 1 in 10 will be spicy! These are some of our favorites that we grow. I will post an awesome, easy blistering recipe that makes for a great appetizer. We hope everyone has a really great week and enjoy this week's bounty! Cheers! Hey everyone, welcome to week 9 of your CSA. We hope everyone is well and had a great weekend! We are really starting to see tomatoes come out of the field. Just in the last couple of days we have harvested several cratefuls! I wanted to give everyone a chicken update. Our girls are a little over 15 weeks old and getting big! It is pretty wild that they grow so much over night. In the last couple weeks we really saw them jump into adolescence and soon they will be of laying age. Pullets usually start to lay around 20 weeks. So in a short month we should start to see some good egg production! We just ordered the fencing we will use when moving them from pasture to pasture. We have had some predator issues, but hopefully it will stop. 2. Romano Beans- Italian string bean! It is a flat string bean. Hello folks! Welcome to week 8 of your CSA! We hope everyone had a safe, eventful weekend with family and friends. Last week got a little busy and everyone but baby Ivan had the stomach bug! Hazel was able to hold off the sickness until after we celebrated her 3rd birthday, so that was fortunate! A lot has been going on at the farm! We had all of the broccoli ready at once, as well as the cauliflower. We had to donate well over 1,000 lbs of broccoli and now we are going through the cauliflower and finding hundreds of lbs to donate. The weather this spring was abnormal enough to push all 3 separate plantings to be ready at once. We are definitely in the transition from spring to summer produce. No need to worry this week if you will have more cauliflower, we have a whole new assortment for you! You will definitely be feeling the summer love with this box! We hope you enjoy your vegetables, and I appreciate the feedback, good and bad. Thanks for the support everyone! 1. Beans- Snap beans that are a bush variety. I love to simmer these down with some broth of your choice and a little onion until all the liquid is gone. This makes for a tender bean full of flavor. 2. Cherry Tomatoes- Fresh off the vine and ready to be added to salads, pastas, or just eaten by themselves! 3. Potatoes- Y'all, some oh so delicious creamy potatoes! So excited about these! 7. Cured Onions- Onions that have been harvested out of the field and dried and cured. Hey folks! Welcome to week 6 of your CSA! Hope everyone had a great weekend. So, we were receiving a little feedback and thought we would try something a little different. We are going to double up on items in your box this week. Doing so, you would be able to make some big casserole dishes. Maybe make a couple of casseroles to put in the freezer for an easy dinner one night. I know I need things as easy as possible now a days! I have added some recipes and they seem to be kid friendly as well. I really love the recipe below for a healthier broccoli and cheese casserole. Made with quinoa and whole grain bread crumbs. You also won’t find mayonnaise or cream of mushroom in it. I’m sure you could add some shredded or cubed chicken to it also! I also have added a recipe for slow cooker greens. It does call for a ham hock, but I have found just using bacon or skipping out on the pork, and it is still delicious! Might as well go ahead and put some greens up in the freezer. Here pretty soon with the heat, they won’t be able to grow. Cauliflower takes on the flavor of pretty much anything you want it to. One last recipe I added is for a loaded cauliflower mash recipe. It is low carb since you are replacing the potatoes with cauliflower. I would love to hear feedback if you like the doubling up on veggies, and what you make. Hope everyone has a great week! Top Row left to right: Torpedo Onions, Golden Beets, Swiss Chard, and Bulb Fennel. We received our new delivery truck! Van has it today in New Orleans. Later this week we will attempt to do a second delivery in New Orleans and also the Crescent City Farmer's Market on Saturday. It should be a busy weekend! 1. Mizuno- A braising mix of red and green mizuno. This mix is flavorful and colorful. You can really use any of our greens to braise. Add any greens to this mix if you need to stretch it further for a meal. See easy recipe below. I personally use coconut oil or butter and sometimes i like a squeeze of lemon to replace red pepper. Also, mizuno adds a lot of flavor when chopped thinly and added to a salad. 3. Torpedo Onions- A variety of spring onion that is longer with a smaller bulb. Looks like a torpedo. 7. Fennel Bulb with Fronds- Fennel has a familiar anise flavor. The bulb is great to chop and caramelize with onions. Have it as a side or add to pizzas and pastas. Also, i like to save the fronds, the long leafy greens, and use them to flavor different dishes. I added a recipe below, but be aware it takes a little over an hour to prepare. It is easy tho, one of those dishes that you can stir every so often as you prepare the rest of your meal. 8. Sweet Peas- This variety of peas are best when shelled. They are a great snack for on the go, just sitting around, added to salads, or shell, cook, and add into a main dish.